Her musical tastes ranged from classic rock like Deep Purple to devotional music of Muslim mystics like Nusrat Fateh Ali Khan. She was born in India, but completed her education in America and managed to bridge the traditions of both countries. And as her life ended in tragedy during her second shuttle mission, Kalpana Chawla is being mourned by admirers in India and America alike. "She was very much a role model for Indian Americans, particularly for girls brought up here,” said Bhailal Patel, president of the National Federation of Indian American Associations, an umbrella group based in Silver Spring, Md. Chawla, 41, is a naturalized American citizen who lived in the Houston suburb of Seabrook, about 10 miles from Johnson Space Center. But she was born in Karnal, India, the youngest of four children who grew up less than 75 miles from India's capital in New Delhi. Her rising career was very closely followed by schoolchildren, engineers and women in India. "People were extremely proud of the fact that a woman of Indian descent had risen to such heights and had become so visible,” said S.N. Sridhar, chair of Asian and Asian American Studies at SUNY Stony Brook. "She was considered a good way to showcase the achievements of Indian women.” "Almost every Indian is quite saddened," said Anish Keskar, 28, a resident of Pune, India, who said Indian television was filled with news of the tragedy and interviews with her school principal and others. The Tagore School in her hometown of Karnal was hit hard by the news. Chawla had arranged for five students from her school to come to NASA every year for a space-program visit. She received her bachelor's degree from Punjab Engineering College in India in 1982, then went to Texas to begin her graduate work despite getting many job offers in India. She met her husband of 14 years, flight instructor Jean-Pierre Harrison, shortly after coming to America. 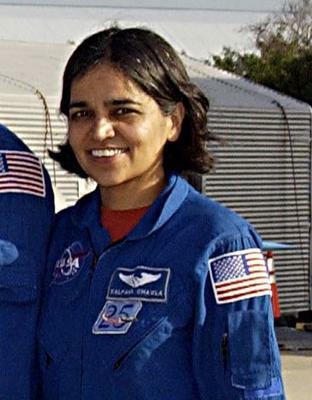 In two years, Chawla earned her master's degree in aerospace engineering from the University of Texas at Arlington, before earning a doctorate degree in aerospace engineering from the University of Colorado-Boulder. Chawla, whose first name Kalpana means "thought” or "imagination” in the ancient Indian language Sanskrit, in a sense lived up to her name. In previous interviews, Chawla said she always thought she'd become an engineer rather than an astronaut but then realized that the posters she kept on her dorm-room walls of shuttles and space probably subconsciously pushed her aspirations. "You see the continents go by, the thunderstorms shimmering in the clouds, the city lights at night. The Nile River looks like a lifeline in the Sahara. And we looked down on Mount Everest. Earth is very beautiful. I wish everyone could see it,” Chawla said, describing the view from space in an interview with the UTA Magazine for alumni of the college, from which she graduated in 1984. Professors who taught Chawla at UTA remembered her as a quiet woman in school, but an energetic mentor who gave back to the university. After Chawla went on her first shuttle flight in 1997, she gave a presentation to students and faculty on the trip, said Don Seath, professor of aerospace engineering at UT Arlington.